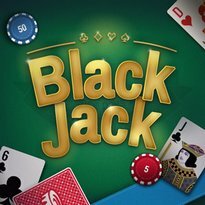 How to Play Blackjack The rules of this free online game are pretty simple: 1. Make a bet from $1 to All In. 2. The dealer will give you two cards and show one of his cards. 3. You can double your bet anytime before you hit or stand and split your bet if you get two cards of the same value. 4. You have an option to add more cards by choosing 'HIT' but you lose automatically if your value of cards exceeds 21. 5. Click 'STAND' when you are ready to play the hand. 6. The dealer will reveal his hidden card and must always hit if they have 16 or lower. They will stop hitting if they have 17 or more. 7. You win when the combined value of your cards is greater than that of the dealer.